It's no secret that China's economic growth over the past decade has been remarkable. That said, I wanted to take some time, put together some figures and study, illustrate and share just how remarkable this journey really has been. I've pulled together figures from the FED, OECD, IMF, PBoC, and other media sources referenced below under "Methodology". Suffice it to say, it took some time to compare and contrast sources, as well as assess the credibility of same. But I'm hopeful that the end product of this effort gives a concise Executive Summary of where the Chinese economy stands today and where it's headed. Detailed calculations in an Excel format are of course available for the asking. My first task was to simplify all of these numbers and discard what looked to be inaccurate noise. I wanted to develop a comparison that was easy to visualize and understand. I settled on a "Per Household" format. The two charts and the table below compare US and China's growth in GDP, Total Debt (Public, External & Private), Stocks (Market Cap of NYSE & NASDAQ & SSE & SZSE Respectively), Money (M2) and Residential Housing. All figures are calculated on a "Per Household" basis in US$ for ease of comparison. 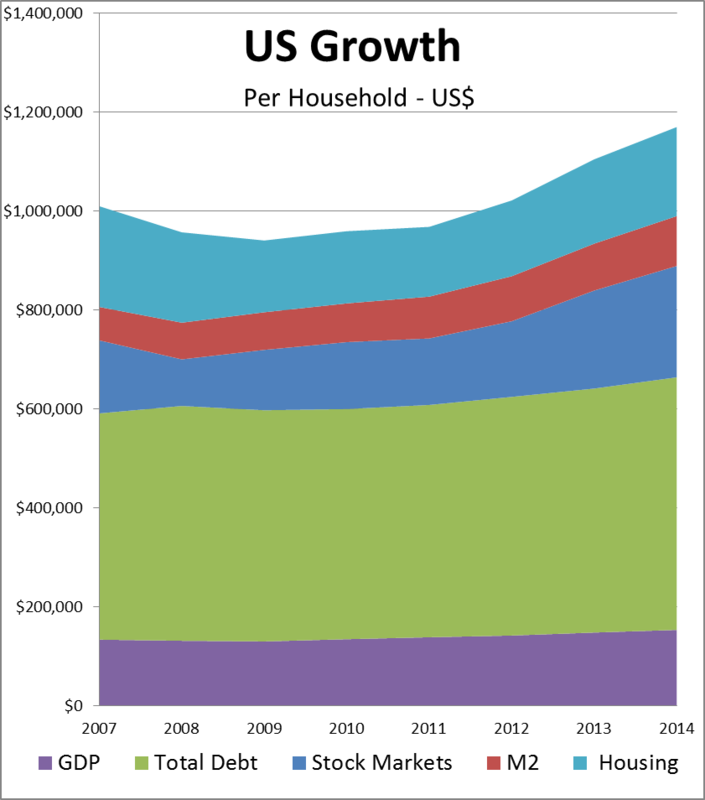 Note: Base year 2013 households are 115 million (US) and 396 million (China) adjusted annually by population change. The analysis of these "Assets" per household illustrates some startling shifts that took place since 2007. China's "Economy per household" started at a much lower level than the US, roughly $100,000 vs. $1,000,000 per US household. Beginning in 2007, China's Total Debt (Both Public and Private) was only about 25% of these asset classes. Residential Housing was about Half. Contrast that with the US where Total Debt was roughly half of these asset classes with Residential housing at about 20%. There are, of course, reasons for this, but since 2007, China's Debt has nearly quadrupled, Housing Investment has doubled and M2 has increased two and a half times. 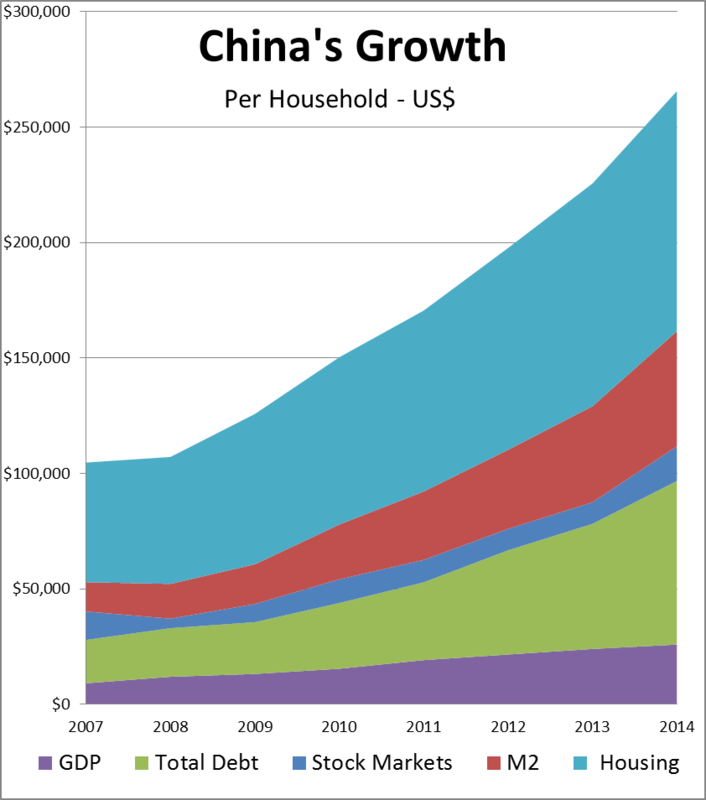 China's "Economy per household" has increased 150%. In the US, our economy has marched along at a respectable, measured, pace. The stock markets are up. The money supply has increased at a 5-10% compounded annual rate. Debt is up slightly and Housing investment has actually declined a bit since the financial crisis. Generally, life is good. Now, lets take a slightly oversimplified look at how we arrived at where we are today. Every Central Bank, specifically the FED and the Peoples Bank of China (PBoC) have three (3) sets of tools available to shape the economy (with myriad sub-tools in each set). The tools are: Open Market Operations, Interest/Reserve Rate Management & the Money Supply. Open Market Operations. i.e.) Quantitative easing or tightening. (aka QE 1,2,3,4, etc.) Conceptually, the central bank buys/sells securities on the open market to increase/decrease the money supply. The analysis of what to buy/sell and the intended consequences/effectiveness of the transaction is a topic for a doctoral dissertation, but again, let's take a high altitude view. Let's take a look at Central Bank Open Market Ops from 2007 to 2014. The FED & PBoC have purchased assets at an unprecedented pace over the last few years, ballooning their balance sheets and increasing the money supply at a rate never before seen, at least to my recollection in a non-wartime economy. A noteworthy item is that the PBoC has been consistently buying and carrying roughly 80-85% of it's assets in US$ denominated securities (T-Bonds/Bills) aka the "Great Wall of Currency" I spoke of in my last post. Moreover, it's astonishing that the PBoC is currently carrying roughly one Trillion US$ in assets greater than the FED on a an economy with a GDP a little more than half the size of the US. Both Central Banks have had the "Foot on the Gas" for quite a while now. Can you say "economic stimulation boys and girls? "....sure, I knew you could. As we all know, after the financial crisis, the FED embarked on an unprecedented zero-interest rate policy and has held steady ever since. The FED Funds target has been set at 0.25% since 2008. Conversely, the PBoC has kept interest rates relatively high. As you can see, the PBoC Base Rate has hovered around 6% for years. With regard to interest rates, the FED has had the economic stimulus "Pedal to the Metal" while the PBoC has actually been limiting liquidity with higher interest rates. Consequently, this more constrictive interest rate policy has begun to put a drag on the economy. According to China's NBS as described in the Standard Chartered Bank white paper cited below, China's debt burden has risen to more than 13% of GDP as of 2013 (up from 8% in 2010) and it's expected to increase in 2015. Contrast that with the current Interest Burden in the US as reported by the FED at 2.8%. To put it another way, for every dollar of GDP earned by the Chinese people, it costs them 13 cents in interest. In the US, it costs us only 3 cents. It's interesting how, even with record low interest rates, the US economy just hasn't been accelerating as fast as China. Don't worry, we'll discuss this anomaly in more detail shortly. Finally, Central Banks increase the money supply by making loans (providing liquidity) to Commercial Banks. They simply "create" credit. Commercial Banks make loans to businesses and individuals. In a perfect world, everyone succeeds, the economic cycle increases, businesses generate profits and everyone pays their off their loans. Credit expands and the money supply increases. The economy takes off. This is where the PBoC has made the FED look like like a bunch of crotchety old misers. Again, on an economy about a little more than half the size of the US economy, the PBoC has increased the supply of Renminbi nearly four fold, from about US$5 Trillion to nearly US$20 Trillion. Put another way, M2 in China is twice that of the US on an absolute basis. How Did This Gigantic Increase in China's M2 Happen? "Thursday, Cloud Live Technology Group disclosed it did not have sufficient funds to make a bond payment due April 7. The Shenzhen-listed company, which had sold 18 Hunan-style restaurants in December to go into cloud computing, stated it had raised 161.4 million yuan, far short of the 402 million yuan owed this week. The expected default could be the first failure to repay bond principal in the history of the People’s Republic of China." Needless to say, if I were an investor in Cloud Live, thinking I had invested in a wonderful, growing restaurant chain, the last thing I'd like to hear is that the business had sold it's assets and transitioned to "cloud computing" overnight. The skill sets required to sling a wok or wait tables are hardly interchangeable with running a server farm and a fiber optic network. I'd feel hoodwinked. I've written extensively about the mis-reps that go on in ADR IPOs. BABA, NQ, NOAH, QIHOO, etc. as well as the long list of ADRs that have "gone dark" over the last few years (See "the China Syndrome" on this blog). There isn't a day that goes by without some odd, outside-the-box ADR acquisition announcement, partnership or new scheme reported on Google/Yahoo finance. The fact that there's never been a failed bond issue in China (Gordon refers to them as "Fake Defaults") has nothing to do with the efficacy of the business models or the ability to raise capital, but has everything to do with the PBoC's effort to "guarantee everything". To the PBoC failure is not an option. Oddly, according to the World Bank, China has been reporting Non-Performing Loans at a rock-solid 1% since 2010. By comparison, the US NPL ratio was 2.3% in 2014, down from 4.4% in 2010. For reference, Greece's 2014 NPL ratio stood at 33.5%. Of course, the difference between the reported numbers is definitional. There's an inherent bias by Chinese bankers not to acknowledge that a loan is non-performing. It's easier to change the terms of the loan and move forward. Like magic, the loan is "performing" again. The big five banks, at the behest of the PBoC continue to step in and provide funds, usually through intermediaries, recapitalize and restructure the floundering businesses and everyone gets paid. Everyone goes home happy and another default is avoided. The PBoC keeps the Renminbi printing presses working overtime. In contrast, the reason that US home prices, stocks and business valuations haven't skyrocketed (at least to the extent they have in China), even though the FED has provided virtually free money for seven years, is that we do something in the US that I'll refer to as "Underwriting". In other words, if a banker thinks that there's a possibility that a loan won't be repaid, the loan simply isn't made. Underwriting efforts in China are, to be kind, much less rigorous. Things are built and manufactured, directed by the state, without regard to the utility or profitability of the endeavor. People are paid, greased, bribed and "taken care of". Interest rates are increased to compensate for additional risk, but the loan is nonetheless, funded. Asset mis-allocation is a significant problem. According to Standard Chartered Bank, the vacancy rate in residential real estate in China currently stands at more than 22% and it's increasing. At the peak of the US Housing Crisis, the highest vacancy rate was barely over 3%. There are anecdotal stories of acres of raw steel rusting in fields because there is no current need for the inventory. Empty trains, ships and warehouses sit idle waiting for passengers and freight. If you've ever seen a vacant building, it doesn't take long for rats, bugs and pigeons to take over. The cities are littered with half finished construction projects and abandoned job sites. And of course. in China, the occasional school teacher or restaurateur turned e-commerce tycoon or cloud computing entrepreneur are legendary. Every one of these bailouts increases liquidity and pumps up RMB denominated M2 in the economy. Unfortunately, the PBoC does not seem to be managing the Renminbi, the Renminbi seems to be managing the PBoC. Let's look at a couple of other pieces of data. First, according to the IMF, only 2.17% of the worlds currency payments (by value) are settled in Renminbi/Yuan, compared to 44.69% for the US$ and 28.30% for the EUR. Cross border use of the RMB is sparse when compared to other currencies, but growing. In January of 2013 the RMB represented only .67% of world clearing volume and was ranked 13th. The RMB is currently ranked 5th (as of December 2014 behind the US$, EUR, British Pound and Japanese Yen) in clearing volume by value according to SWIFT. Up to now, the currency has been relatively isolated and the valuation "is what the PBoC says it is". But as the RMB becomes more important in terms of settlement, the relative value will be more heavily scrutinized. The market, rather than the PBoC, will, at some point make a decision as to what the currency is really worth. 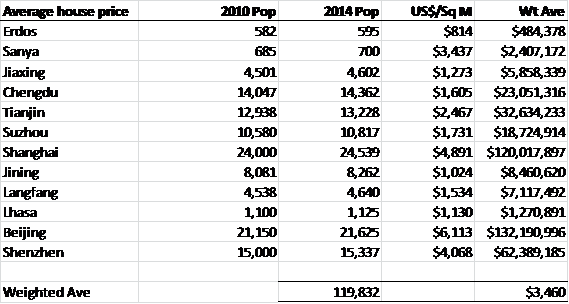 Next, let's look at the inflation rate as calculated by China's NBS (National Bureau of Statistics). As we compare this data to the US data we see an odd symmetry. Even though monetary policy has been vastly different we see that China's inflation rate somehow roughly tracks the US rate. How can this be you might ask? Like the CPI in the US, the NBS samples 600 or so consumer goods and calculates the price change. Unlike the US, where prices are determined by supply and demand, in China, many of the goods in the basket are State Regulated goods (Rent, electricity, public transportation, drinking water, etc.) Call me a skeptic, but I find it odd that the NBS can publish a current inflation statistic reflecting a 2% price increase (including Rent) when everywhere you turn, a pundit, developer, economist or banker is talking about the incredible 20% annual run-up in China's Residential Real Estate market. In the end, a currency is just another commodity. Like any commodity, oil, gold, lumber or pork-bellies, it's value is established in relation to other things (usually other currencies). So what's the RMB really worth? Again, right now, the RMB is worth exactly what the PBoC says it's worth. This is only possible today because the RMB is used at a disproportionately low level for international payment settlement. The worlds second largest economy had always been "closed" and the rest of the world has had little use for the RMB and nowhere to spend it. Moreover, the PBoC has $3.5 Trillion US$ in reserve to protect the RMB value. Now that China's economy is opening up, the RMB will actually begin to matter as a global currency. Now, let's take a look at the above chart. All else being equal this chart is an economic impossibility, yet the condition exists. Even though the "supply" of RMB has increased four fold since 2007 the RMB per US$ exchange rate has remained rock solid in a range of about 6.5 +/- RMB to the US$. You'd expect a significant decline in the exchange rate with a money supply increase of this magnitude, yet it hasn't happened. The RMB is a miracle of modern economics. Today, the US financial markets hang on Janet Yellen's every word and cringe at the possibility of a quarter point rate increase. The talking heads debate what the word "patient" really means and what the implications of including it (or not) in a speech might hold for our nation's financial future. Could you imagine if the FOMC minutes reflected Fed Governors' discussions along the lines of "Hey, why don't we quadruple the US Money supply over the next few years? What do you guys think about that?" The Stock Markets would skyrocket, we'd be using wheelbarrows to carry money around and my building janitor would have a six-figure salary, but unfortunately a loaf of bread would cost $20.00 (unless of course the Government mandated that bread should continue to be priced at $2.00 per loaf) and money would be leaving US$ denominated assets faster than an Investment Banker can cash a bonus check. Conversely, in China's Dream Economy, you can quadruple the money supply, maintain a constant exchange rate and experience relatively little price and wage inflation while making ill-conceived, unprofitable and unnecessary investments in residential real estate, train stations, airports, roads and bridges which don't come close to matching the needs and budget of the population, financed and re-financed with default-proof loans and bonds, subsidized by a Central Bank that has never met a guarantee it didn't like. As we all now know, and some of us have unfortunately experienced, Real Estate values can change quickly and loans can go bad. Despite what the PBoC would have the world believe, Bonds really can default. The end game here is that the RMB today just isn't worth as much the world thinks. What's it really worth? Again, we can speculate, but the value will eventually be determined by the markets rather than the PBoC. If I were a betting man, once the PBoC starts to exhaust it's Great Wall of Currency after trying to support an unsupportable Renminbi, I'd think the value would settle in much closer to a nickel than fifteen cents. Once this value is reestablished, the value of China's assets, including all of those US$ denominated ADRs & Bonds will also be re-priced, and that's not going to end well for anyone. China's Dream will soon become the world's Nightmare. Forbes -Gordon Chang - "Fake Bond Default"
Above, we discuss changes and relationships in China/ US GDP, Total Debt, M2, Stock Market Values, Housing Stock, Central Bank Assets, Inflation Rates, Interest Rates and Currency Exchange Rates. Every statistic charted within the body of this post is tracked/calculated and reconcilable by multiple, reputable sources (IMF, FED, OECD, NBS, PBoC, etc.) with the exception of China's Residential Housing stock and pricing of same. 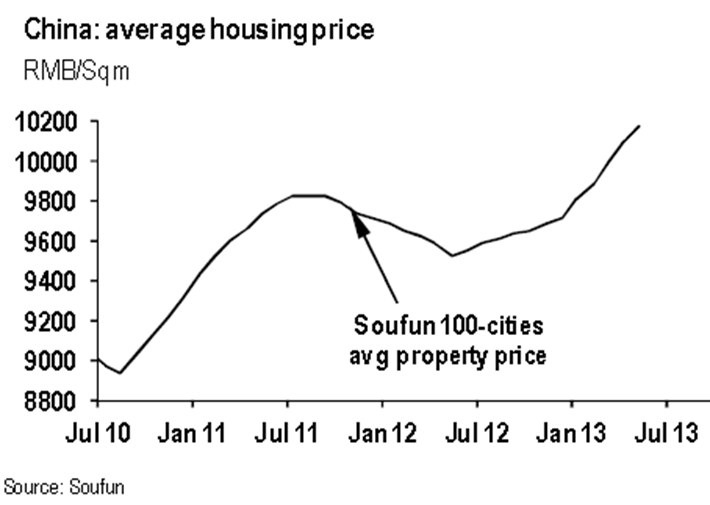 There are myriad anecdotal studies out there establishing some sort of "Housing Price Benchmark" in China. All of them yield vastly different results based on where/how and why they were conducted. I freely admit, that the China Housing Stock numbers described in this post could/should be subject to much scrutiny and potential error. Thus is the peril an economist faces when they've got bad/biased data. If there are any economists, bankers or investors out there that think they have "better" (as in "more accurate" rather than the NBS version of "better") numbers, I'm all ears. Please feel free to share your work and I'd be happy to plug your cost/sq. meter calculations into my model. Value per sq meter, Aggregate Value, or any relevant data Residential Housing Data is not kept/tracked or published by the PBoC. Interestingly, the English version of the PBoC website has not reported statistics in an annual tabular format since 2010. The tables have been replaced with rambling reports analyzing and discussing incomparable, inconsistent indicators. It's much like reading ADR filings, nothing is comparable and everything is "re-stated". Conversely, the FED tracks housing values consistently in the US and the FED values have been used for the purposes of this post. As a point of reference, I've used US$943/sq. Meter or US$87.63 per sq. foot. as 2010 Base Year Comparative households are 396 million for China and 115 million for the US (base year 2010) Per the Economist Intelligence Unit. Comparative figures for other economies are also described in the article. Other studies available, deemed to be non representative or overstated. Two examples are shown below. There are many "studies" out there. Most show much higher values US$1,500/sq. Meter (US$140/sft.) to US$3,400/sq. Meter (US$315/sft.). Statistics seem to generally reflect higher urban values (Beijing, Shanghai, Shenzhen, etc) offset by much lower rural values. But because the anecdotal data seems to be skewed to the higher end by developers, an "average" value is difficult to calculate. US$943/sq. Meter or US$87.63 per sq. foot, would seem to be conservative.